Ever wondered if technology could advance to the point of making machines talk? Ever wondered how technology can evolve artificial intelligence to the extent of almost creating new life? It’s a pretty in depth debate and discussion that will have to leave us with many questions. 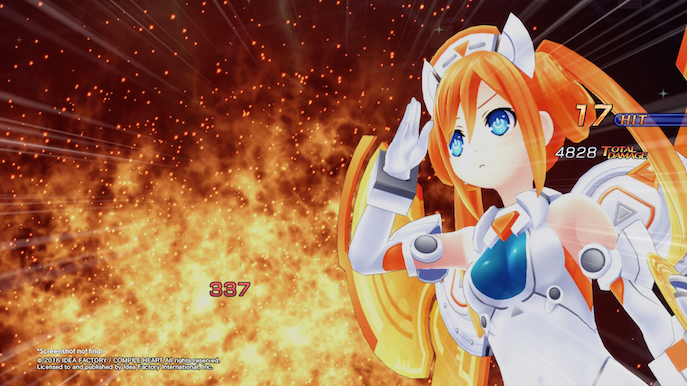 However, let’s just talk about how awesome technology and anime mixed up can be for gaming! And how it can manifest into interesting and charming JRPGs. IT'S NOT HYPER, IT. IS. MEEEEEGA! (...dimension). Compile Heart and Idea Factory unite once more to bring us probably their biggest game yet, Megadimension Neptunia VII is filled with your favorite characters from the franchise, lots of weird gameplay shenanigans, an interesting yet peculiar writing for the plot, and of course: Fan Service. The game is currently released for Sony’s PlayStation 4, with great visuals, sound and decent (not stable) framerate. 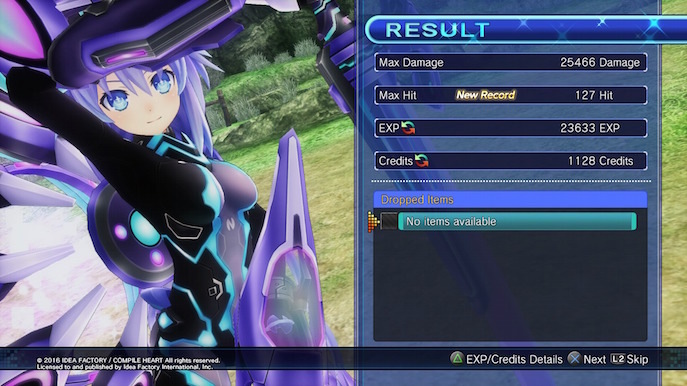 If you’re familiar with the Hyperdimension games, you can easily tell how each has their own set of stories that almost feel standalone, sequels feel slightly related. In NepNep VII the story is divided into 3 dimensions, which at first were thought each to be a separate game, fortunately we have them all in one. You get to play in each of these dimensions when the time comes, dealing with different situations and encountering new characters (as well as play as most of them). The game features a decent amount of items and equipment that should significantly improve your character’s overall stats, but in my experience, it takes a while before you get decent improvements, nothing some insight and exploration can’t solve. Like most (if not all) Compile Heart games, they tend to do “cutscenes” in the style of Visual Novels, only that these ones have animated sprites, and all characters are voiced for most of the game (at least the important scenes). 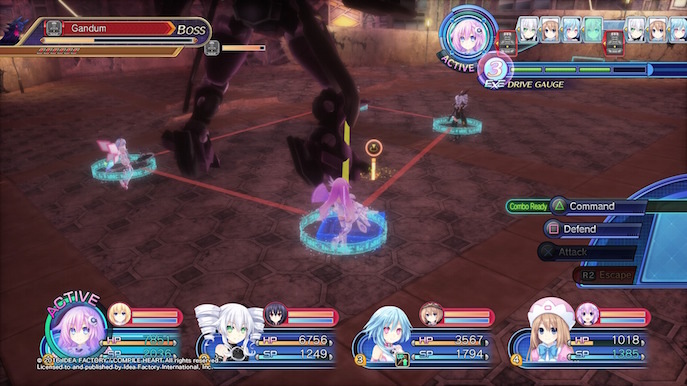 The other part of the game features 3D characters ands environments, you have a party of characters from which you can choose one as the leader and control her in third person. The dynamic of the game is to beat a story dungeon; which is basically a large map with hidden treasures and enemies. The thing I find weird is how these dungeons are quite wide and have a lot of space for secrets, yet you only get 1 or 2 lootable things, it lacks hidden switches or puzzles that could give a lot more to the game’s enjoyment. However it does has some locked treasures which only imply you have to unlock a certain skill to obtain them, a reason for replayability. As for monsters, once you encounter an enemy you face either that 1 enemy or a whole pack, it’s kind of random. This is basically a turn based game; in encounters you get to strike with a character at a time, choosing what she will do against which enemy unit. 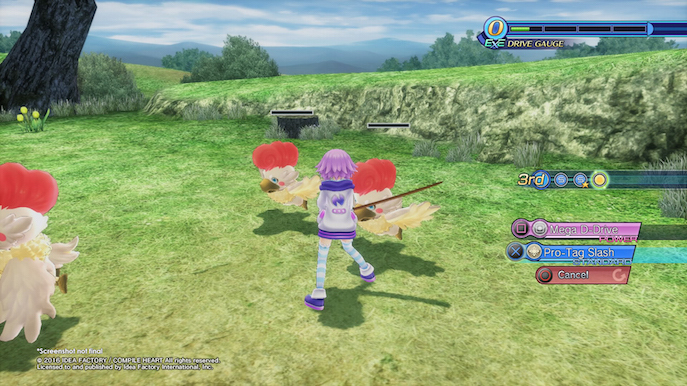 The fun part about NepNep VII is how you can level up your character and unlock new skills and combo abilities. You can customize each character combo’s and fill a gauge bar, this bar can be spent to perform stronger abilities or transform. 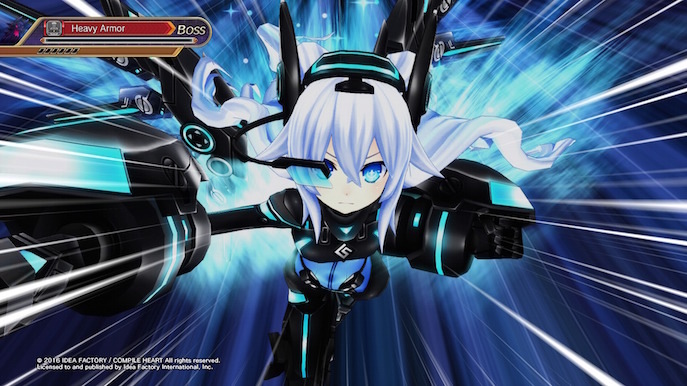 Yes, each character in this lore is a CPU, which grants them the ability to have an HDD transformation that boost their stats and gives the new skills. So the fighting dynamic goes down to filling up your gauge enough to transform and then take care of monsters. This is an aspect from which the game shines, the fact that each character can transform gives it a lot more flexibility to the characters. The whole idea that the transformation basically changes the character in almost every way is fantastic; personality, voice, even body type, it’s as if they are duplicating the cast. Well it’s pretty much anime. The art style focuses on making each character unique, even though they go to the cliché of giving each character a respective color. However their personality and design portray gaming consoles in very curious yet interesting ways, which is something pretty unique from the franchise. The backgrounds are very well illustrated; they resemble each environment enough to make you feel immersed. When you get into the dungeons you see the 3D representations of these backgrounds with a drastic chance of style, nevertheless is fairly well decorated. However some places can experience some frame drops, what? It's probably hard to render that fan service. I personally criticize the music cues in games, especially in Visual Novels. However, NepNep VII has been rather amusing. During my casual play through, I did not notice the cues (at least very few), this is a huge plus as music (or the overall soundtrack) should not be noticeable for the player, as it should just help immersion and makes gameplay as fluid as possible. The music tracks are well balanced and appropriate to the themes, as in all this sci-fi tech anime kind of deal. 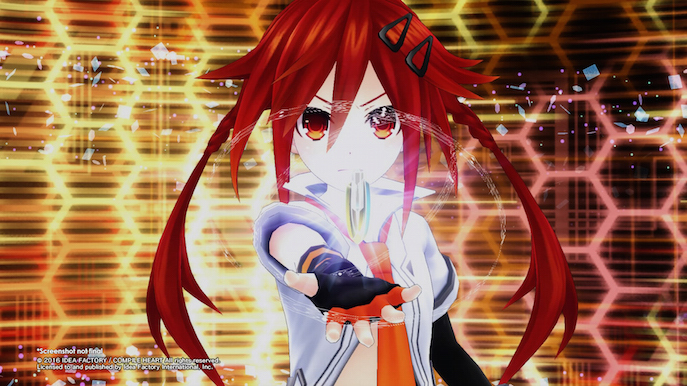 Is not as pumped up as other titles like Fairy Fencer F, but it does its job. 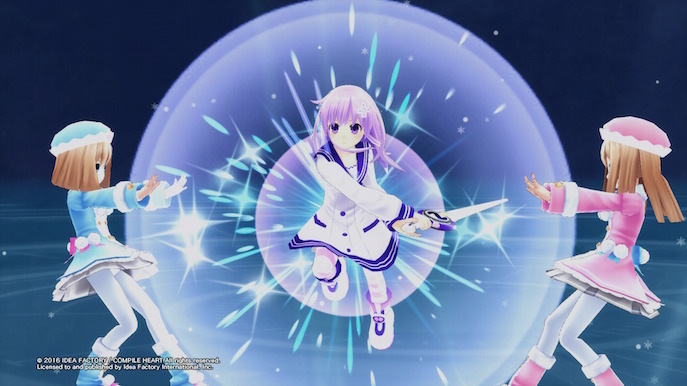 Megadimension Neptunia VII is the latest installment of a funny series with lots of references, anime, breaking the 4th wall in gaming and overall entertaining plot. One of the biggest appeals of this game is the fan service of course, and even though that element can prove to split the audience, the game doesn’t hold back on being fun. + Fun and easy to learn gameplay. + Decent writing. Dialogues are funny at times. + Great looking visuals for console. + Decent music tracks and cues during every element of the game. - Can become repetitive and pacing of gameplay can be heavily affected by the VN style cutscenes (and viceversa).